The top section of that diagram represents the name of our class, the middle section represents all the Fields we require and the bottom section holds any Methods or behaviours this class provides. 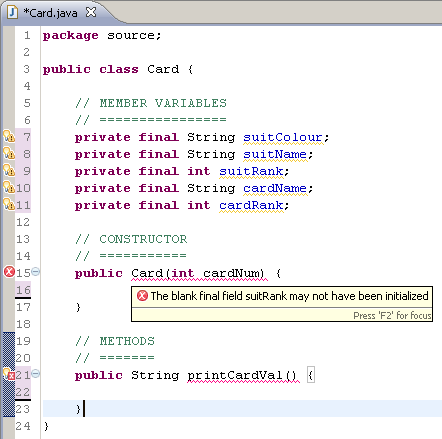 So converting to Java code should be relatively simple. 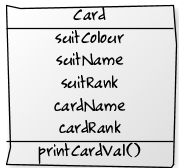 You can see here we’ve given our fields appropriate data types and really, this is not much different to any procedural programming language. The only thing you might find a bit peculiar are the words “private” and “final“. These will be explained later. Eclipse is pretty good at finding your errors and suggesting ways to fix them so while it might seem annoying to be constantly reminded of where you’re going wrong, it’ll help you get things right in the long run. Done! The other errors listed are because of our empty Constructor and Fields. This is probably a good point to stop and explain Constructors.